Which men’s climbing harness is the best? Well, climbing is a passion us. Just the sight of climbing harnesses makes us giddy with excitement. 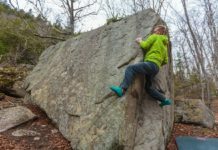 This was a fun review for us to do because we love climbing and love taking “test” falls nearly as much. We spent hours in each of these harnesses. During the course of the review, if the sun was shining we were out climbing. We had some ice climbs, multi-pitch routes, and both sport and trad climbs at crags in Northern California. We asked all our climbing partners to wear test harnesses and gathered input from over a dozen people. Read on to see how we ranked each harness for comfort, features, mobility, versatility, and adjustability. Built with ergonomic freedom and longwearing performance for versatility on rock and ice, the AR-395a hits the sweet spot where innovation, comfort and performance converge. 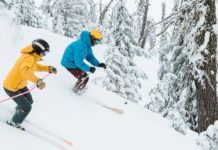 The Arc’teryx AR-395a battled it out for our top choice – it ultimately earned top honors because it has an excellent mix of features that make it excel in almost all disciplines. This was the most versatile harness in the review with a few downsides. We especially loved the huge gear loops and rear haul/fifth gear loop at the rear for a belay device and/or some extra biners. This harness is extremely mobile and perfect for everything except really extended hanging. We were skeptical of the lack of padding but found that it was adequately comfortable for all our climbing needs. If you venture onto longer big wall climbs, you will want something with more padding; however, this is an excellent all-around harness that is supremely versatile. If you can swallow the price tag, we suspect you’ll love this fancy looking harness that seems to disappear the second you put it on, but is always there to catch you when you fall. The best cost benefit between our reviewed Harness. Who knew that $60 could buy this much awesome? This harness has accompanied us on ice, big walls, sport projects, long alpine routes, and gym climbs alike. With dual buckles and adjustable leg loops, the Petzl Corax is pretty much guaranteed to fit and has the features you need for pretty much any climb. While not the cheapest harness in the review, we find it to be an exceptional value. Some climbers have used this harness for years and still keep coming back. 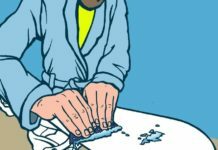 It may weight a little more than other harnesses out there, but if you’re worried about the added cost of a couple ounces, you should probably start by getting a haircut and climbing without a shirt. If you take friends climbing often, this harness covers an extremely wide range of sizes and body types making it a great harness to lend. The Black Diamond Chaos is an excellent harness and many of the climbers we talked to liked it as much or more than the AR-395a. The Black Diamond Chaos is an excellent harness and several of our testers liked it as much or more than the AR-395a. Like the AR-395a, it uses a construction that spreads the load evenly, but it is a little stiffer. Though it has some padding, it is surprisingly lighter than the AR-395a as well. Abrasion resistant patches and four prominent gear loops (positioned slightly towards the front for easy access) make this a great pick for your next trad climb. Additionally, the rear haul loop is rated to 12 kN so you can be sure it won’t break while hauling a tagline or pack. If this harness had ice clipper slots, it would have been more versatile and likely could have won our Editors’ Choice award. As it doesn’t have these, it is best used for rock-specific adventures away from ice and alpine environments. If you’re looking for a fantastic, comfortable, and lightweight harness for your next trad climb, the Black Diamond Chaos is tough to beat. – repeated. 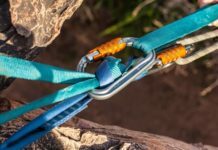 Let us be clear right off the bat: all of the climbing harnesses in this review are equally safe when used in normal climbing situations in accordance with the manufacturers’ recommendations. Testing the breaking strength of any harness components is beyond the scope of this review. 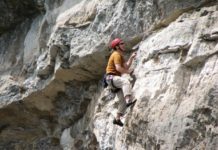 Buying a climbing harness that fits you well and is comfortable will significantly improve the quality of long belay sessions and hanging belays. You’re going to spend a long time in your harness, so buying one that is comfortable and fits well is paramount. A good harness is a fantastic investment in your climbing future because it will most likely outlast your rope and shoes. If you find a harness that you love but are turned off by the cost, just remember that you’ll likely wear out several pairs of shoes and multiple ropes before you need to replace your harness. If you’re trying to get into climbing on a budget but have a couple extra bucks to spend on one thing, spending that money on a harness. Buying a harness that matches your needs perfectly is a more efficient use of your hard earned dollars than buying expensive shoes that will need to be replaced much sooner. Do yourself a favor and buy the right harness the first time and never look back. Men’s and women’s bodies are different. This is clearly obvious, but it’s also important because men tend to wear harnesses on their hips while women often wear them on their waists. Because of this, the rise on men’s harnesses is usually shorter than that on women’s harnesses. Also, women usually have wider hips relative to their waists than men. The ratio of the waist and leg loop adjustability is also a bit different between men’s and women’s harnesses. In comparison to a men’s climbing harness, a women’s specific design often has slightly larger leg loops relative to the waistbelt length. 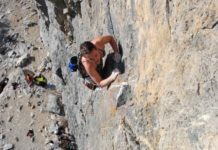 While most male climbers will find the best fit in a men’s specific harness, some of us might get a better fit in a women’s harness. If your thighs are the size of trees, and you find the leg loops on most male harnesses constricting, don’t be scared to try on a women’s version. The “rise” of the harness refers to the distance between the leg loops and the waist belt. 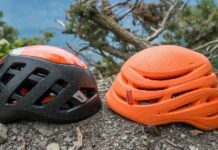 Some harnesses like the Metolius Safe Tech All-Around and even the Petzl Corax are so adjustable that they can usually provide an excellent fit for men and women alike. The Metolius harness is especially suited for a wide variety of body types because the rise can be adjusted. Rock climbing has exploded in popularity over the last twenty years. Thanks to the influx of climbers, manufacturers not only produce all-around models but also offer harnesses with special features for every discipline of the vertical world. Everyone these days can buy a climbing harness that fits well and is perfect for their exact needs. That said, remember that the most important part of a harness is the fact that it will keep you safe, and every harness in this review will do just that if fitted and used properly. You could use any of the products we tested for sport, trad, alpine, or ice climbing and they will all hold you securely. The typical one-size-fits-all gym rental harnesses are often so uncomfortable that it’s a wonder people ever decide to pursue climbing in the first place. These harnesses are great for rentals because they offer unparalleled adjustability but they don’t have any of the features you’ll want if you get into climbing. More importantly, they’re quite uncomfortable when compared with a properly sized and padded climbing harness. If you’re just getting into climbing, you’re probably reading this review to escape the uncomfortable misery of rental harnesses. If this sounds like you, awesome! Welcome to the climbing community. You don’t need a tricked out big wall harness if you’re just taking laps at the gym. You probably just need something that’s simple, cheap, and relatively comfortable. 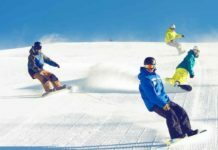 The Black Diamond Momentum fits the bill at $55 and is a great harness that won’t break the bank if you’re just trying to save money by owning rather than renting every week. If you’re not sure that you’ll take your craft outdoors but like the idea of that possibility, be assured that this harness has everything you’ll need for even long and complex multi-pitch routes. You won’t need to upgrade your harness as you progress in the sport. Lighter weight harnesses tend to skimp on padding and are much less comfortable than all around harnesses. This might be OK if you’re crushing moves, but when it comes time for you or your partner to hangdog for an hour, you’ll be much happier and more patient with a more padded all-around harness. Good harnesses for trad climbing should be comfortable and have enough space on the gear loops for all your cams. Hanging belays aren’t that fun in lightweight sport climbing harnesses – instead look for a harness with a little extra leg loop padding. For long routes, it can also be nice to have a haul loop to trail a rope or tagline. When we go trad climbing, we usually end up doing a little more chimneying and general groveling (whether it’s a horrible offwidth in Vedavoo or the Narrows on the Steck-Salathe). To help combat all this wear and tear, we look for extra durability in a trad climbing harness. The Black Diamond Chaos is an excellent trad harness with patches that increase abrasion resistance and gear loops that are placed slightly forward for easy access to your gear. It’s also comfortable enough to hang out in while your partner tries to retrieve that stuck C4 you overcammed. Because you’ll be wearing extra layers, padding isn’t as important for ice climbing as it is for other disciplines. However, there are other features that are desirable for the frequent slayer-of-ice: adjustable and/or detachable leg loops are really nice so you can put your harness on over crampons. Ice clipper slots are also great so you can keep your screws organized. 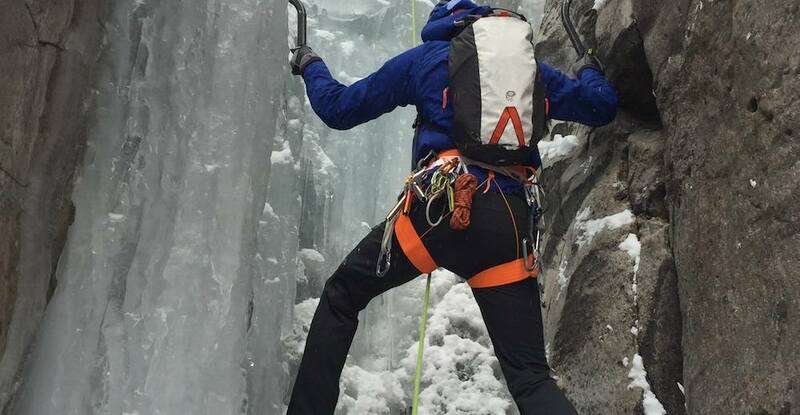 While there are ice climbing specific harnesses, we didn’t include any in this review. That said, the Arc’teryx AR-395a is the best harness in this review for ice climbing with its four ice clipper slots, adjustable legs, and streamlined design. The Petzl Sama and Petzl Corax also have two ice clipper slots each. 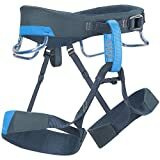 If you climb year round, one of these harnesses will probably suit you well enough for any ice climbing you want to do. Alpine climbers and mountaineers often need the bare minimum when it comes to climbing harnesses. Some manufacturers make harnesses for this purpose that weigh a fraction of the weight of any of the harnesses in this review. These are made with minimal if any padding and are designed to protect you in the extremely unlikely event of a slip. This review focuses on harnesses conducive to more vertically inclined endeavors. All-around harnesses are the workhorse models that work great for almost all disciplines, and as a result, this is the style of harness that’s best for most people. The trade-offs for getting a harness that’s good for everything rather than just one thing are usually extremely small. Although all-around models are less comfortable than big wall harnesses, they are often padded enough that hanging won’t hurt, and they don’t weigh as much as their big wall cousins. They have at least four gear loops and often a haul loop. Sometimes they have adjustable leg loops, sometimes they don’t. The best all-around harness we tested was the Arc’teryx AR-395a, which is why it won our Editors’ Choice Award. Our testers also found the Petzl Sama, Black Diamond Chaos, Petzl Corax, Black Diamond Momentum, and the Mammut Ophir 3 Slide all to be good all-around models. Big wall harnesses are made for extended periods of hanging and are quite padded. 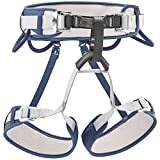 They are the most comfortable type of rock climbing harnesses since they are beefy all the way around and are much heavier than the harnesses in this review. Because of the bulky padding, they aren’t even close to as mobile or comfortable when standing as an all-around harness. Because they are so specific, we didn’t include them in this review, but be sure to check out our Big Wall Harness review. Comfort is a huge thing to consider when buying a harness. There’s a reason you don’t see climbers using bowlines around their waist or wearing webbing harnesses anymore. Part of it has to do with safety, but probably just as much comfort. Standing comfort makes up 20% of our weighting because you’re probably going to spend as much if not more time standing in your harness as you are climbing or hanging. The less we noticed the harness while standing or walking, the higher its score in this category. The lightest and most flexible harnesses typically did the best in this metric. We also liked standing in models with some level of breathability. If you’re going alpine climbing (or carrying a pack with your harness on), gear loops that fold down flat on the back are nice to accommodate a backpack’s hip belt. The top pick, Arc’teryx AR-395a, and the Petzl Sama were the most comfortable when standing and both work well with backpacks. The Black Diamond Chaos was nearly as comfortable when just standing, but the prominent rear gear loops weren’t as comfy with a full-size pack. This will likely be the most important metric for many climbers. With a comfortable harness, you won’t have to dread hanging belays 500 ft off the deck. You can also stay comfortable and keep a positive attitude while you’re belaying your partner on a top rope and they’ve spent the last 30 minutes hanging at the crux. Perhaps you clip bolts exclusively; a harness with good hanging comfort means that when you take a whip for the umpteenth time, your hips won’t take a beating so that you can try “just one more” burn. Hanging comfort is quite important and can make all the difference between a great harness and a good harness. We tested each harness through a series of bounce tests, hang tests, intentional (and unintentional) falling, and belaying. Throughout this process, we took notes and comments from all our testers and compiled them. The most comfortable harness for tester A wasn’t necessarily the most comfortable for tester B, which isn’t a huge surprise since real-world hanging comfort depends largely on fit. Our scores reflect our best estimation of comfort for the average climber. The other key considerations for comfort are an amount of padding, harness width, and overall construction. Not surprisingly, the most comfortable harness was the Metolius Safe Tech All Around, which felt like the most padded. We could hang longer in this harness without discomfort than in any of the others. 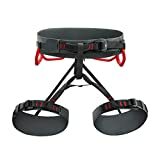 Runners-up include the AR-395a and the Black Diamond Chaos, both of which have less padding but have designs that evenly distributes the load to the entire surface of the harness. Making sure a harness is comfortable to hang in is critical. We highly recommend spending some time hanging in a harness at your local climbing shop before you buy. Most, if not all, climbing shops have stations for you to hang in the harness before you buy. Take a few moments to hang in every harness of interest, noticing if your toes go numb, your thighs are pinched, or you feel off-balance while hanging. 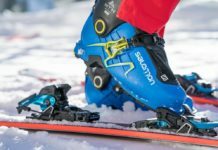 This metric is easy to confuse with versatility, but discipline-specific features give each harness the opportunity to showcase its unique features. 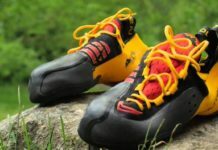 The Black Diamond Chaos scored the highest in this category and received a Top Pick award because it has some really neat trad and sport climbing specific features. The forward gear loops make reaching your stuff a breeze and the lack of an ice clipper slot between the gear loops allows the rear gear loops to sit further forward for easier reach. Abrasion resistant patches on the legs and hips help the harness last for extra years of heavy abuse. Conversely, the features that make the Chaos great for trad climbing make it relatively poor for ice and alpine climbing. The Petzl Sama works well for sport climbing, but the flat gear loops on the back accommodate a backpack hip belt with ease. The ice clipper slots and great mobility make it a great pick for ice climbs. The mobility rating reflects how easily we felt like we could move in each harness. None of the harnesses in the review were particularly restrictive, but there were some subtle differences. The best ones seemed to disappear completely from thought when climbing. Fixed leg loops with elastic sometimes felt more mobile as the elastic has some give when making acrobatic moves. The AR-395a scored the highest in this category and uses a unique leg loop attachment. The ultra-thin material on this harness hugged our bodies so well that it was easy to forget we were wearing it. This is the “all-around” metric. A harness that scored well in this category would be great for a day of climbing anything and everything. Harnesses like the Petzl Sama did well in this category because they excel for climbing ice, in the gym, sport, trad, multi-pitch, and alpine. Harnesses made for more specific purposes scored lower in this metric. The Metolius Safe Tech All Around was our favorite for hanging, but it doesn’t excel at sport climbing, alpine climbing, or gym climbing. Meanwhile, the Mammut Ophir 3 Slide scored better than the similarly featured Black Diamond Momentum because it can do everything the Momentum does but would be better for alpine climbing. This is the metric where a rental harness would win. We don’t recommend buying a harness without trying it on first, but if you do, you’ll probably do the best if you pick a model that scored highly in this category. If you generally find that you’re between sizes or you’re having a hard time finding the right fit, a harness like the Petzl Corax, which has two waist buckles, can often help solve this problem. Speaking of buckles, we should mention that we strongly prefer auto-locking buckles over the standard ones. Every harness in this review has the new style except for the Metolius Safe Tech All Around. Auto-locking buckles are easier to put on and adjust, and seem much safer. In spite of its old-school buckles, the Safe Tech All Around received the highest score in this metric because it has an adjustable waist, legs, and harness rise. The Petzl Corax, also scored highly in this category because its two sizes cover a waist range from 24 to 41 inches. Most other harnesses cover this range in five sizes! If you’re looking for a great all-around harness that you could let friends borrow, this is a great pick. Finally, harnesses with fixed, elastic leg loops scored lower in this category. A harness is one of the most important items in your climbing kit. In addition, it is most likely the item to last the longest before having to replace it. For these reasons and more, finding the right harness is a big decision and a great investment. When making your selection, consider the type of climbing that you plan to use the harness for and keep comfort and fit high on your priority list. We hope that this review has helped you to narrow down the options and find a harness that fits your climbing style.